Since it's dark there when it's light here, should we care? Unfortunately we have to. On 14 September, Russia and Belarus started the Zapad military exercises, close to Europe's eastern borders. The word "Zapad" means "west" in Russian. Moscow and Minsk claim that 12,700 troops and 250 tanks will participate in the joint military exercise at training ranges in Belarus and western Russia. The exercise will end on 20 September. Zapad 17 probably will showcase new Russian capabilities that are intended to intimidate enemies and thrill friends. Its more lasting impacts are likely to be a stiffening of NATO’s determination to not be bullied and a reminder of the requirement for constant vigilance. 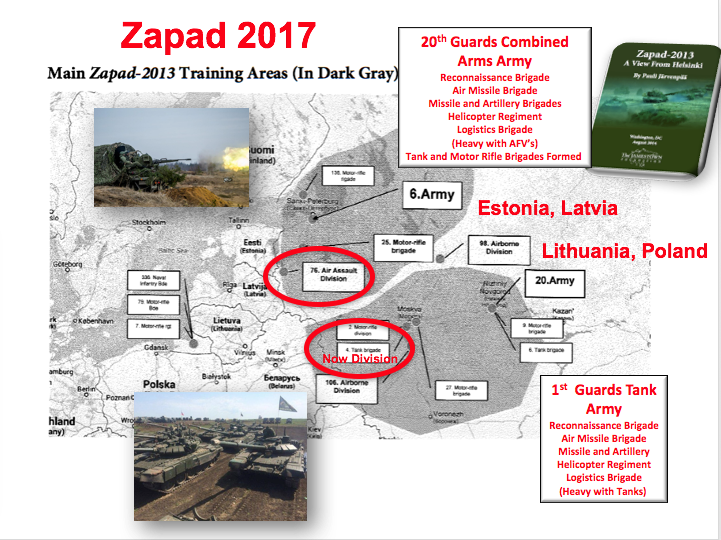 Russian Zapad exercises occur every four years, and the size of this one dwarfs Zapad 13. NATO has already deployed additional troops and equipment to the area, while the United States is patrolling the Baltic countries' airspace. This exercise is an opportunity for NATO to observe Russian progress in rebuilding the armed forces, especially after two years of operations in the Syrian civil war. The North Koreans launched yet another ballistic missile over Hokkaido, Japan on September 15. The launch location was near Sunan, which is the location of the international airport that serves the capital area of Pyongyang. The South Korean Joint Chiefs of Staff said the missile flew for 19 minutes, reached an altitude of 770 kms/478 miles and splashed into the western Pacific Ocean about 3,700 kms/ 2,300 miles east of Hokkaido. This launch proved that a North Korean ballistic missile can reach Guam. The distance from Pyongyang to Guam is 3,400 kms/2,110 miles. The missile followed a similar trajectory to that launched on the 28th. This was the 15th launch of the year. If they launch on Guam, they start a war. North Korea and the United States held a "secret" meeting in Switzerland this week, Japanese broadcaster NHK reported Thursday, 14 September. The meeting took place on the sidelines of an international security forum there from Monday to Wednesday. These are not official talks, but no North Korean diplomat can talk with an American without official approval and surveillance. This contact serves as a reminder that many channels for communication are available to the US and North Korea. On 14 September, the Korean Central News Agency (KCNA) published a rant by the Korea Asia-Pacific Peace Committee (KAPPC), which is a mouthpiece for the North Korean regime. In the statement, the agency called on North Korea to wipe out the South Koreans, sink Japan with nuclear attacks and to reduce the US to ashes and darkness. I won't bore you with the rhetoric (which is a form of misdirection while talks are being held). News services reported several developments which point towards steady improvement in the security situation for the Syrian government. There are a number of reasons for this and I'm not underscoring what the Russians have done, but President Trump's strategy to crush ISIS has worked. You'll never hear that on the corrupt, lying, smug, shrill, mainstream media. In Idlib Governate, the extremist Hay’at Tahrir al-Sham (HTS) alliance, built around the former al-Nusra Front, is fracturing. This is the group that was affiliated with al-Qaida and a rival of the Islamic State (ISIL). Several important members of the HTS alliance have withdrawn over religious errors. In Raqqa, the US-backed Syrian Defense Forces (SDF) claimed they control 70% of the town, after having liberated a district in the city center. The Syrian Observatory of Human Rights said the fighting has been heavy, leaving only a few hundred fighters in Raqqa. SDF losses are said to be high. The SDF also announced that its fighting groups near Deir ez-Zor will not enter the city. This decision reduces the risk that US-backed fighters would clash with Syrian government and allied forces which are attempting to surround the city. The Russian Navy fired seven cruise missiles at ISIL targets in the suburbs of Deir ez-Zor, the Russian Defense Ministry said in a statement on the 14th. It said the missiles were fired from two submarines in the eastern Mediterranean Sea and traveled from 500 to 670 kilometers. The Russians are using nearly every opportunity the Syrian civil war provides to engage in live fire of modern weapons under real conditions. As has been the case - nearly forever - nations which include significant Kurdish populations oppose a Kurdish-run homeland in areas that they control. Turkey claims the right to continue its 'ethnic cleansing' of Kurds. Northern Iraq is very close to becoming independent of Iraq and run by the native Kurds. Portions of Syria will likely end up in the same situation, which isn't acceptable to the Damascus government, but will likely still happen. Will Turkey invade Kurdistan? I wouldn't run it out. The US has no 'official' position but since we're arming the Kurds, the de-facto situation is obvious.